In The Hawaiian Archipelago (1875) the Victorian explorer and travel writer Isabella Bird described the hills of Kaua'i as "more completely smothered under a profuse vegetation than those of any other island in the Tropical Pacific … [it] has an extreme beauty altogether its own, which wins one's love". It does indeed. I'd never been to Hawaii before. I've a wardrobe of aloha shirts, I've seen South Pacific and The Descendants and I can play two tunes on a ukulele, but I'd never made it to the actual archipelago. Perhaps I felt I couldn't share the American 1950s dream about Hawaii. Perhaps I was turned off by the thought of Waikiki Beach, with the palm trees, dancing girls et cetera with a backdrop of skyscrapers. Kaua'i is different, though. You can fall in love with its simplicity. Of the major Hawaiian islands, it's the smallest and greenest. As Isabella Bird indicated, it's a profusion of shaggy mountains, forests folding into each other, palm trees, ferns, cypresses and magnolias jostling for place. The island is shaped like a hand-thrown pizza and its 60,000 inhabitants live around the perimeter because the interior is craggy, wet, mountainous and wholly inaccessible. Partly because of the coral reefs that circle it, the authorities don't allow cruise liners to drop anchor and disgorge passengers. No dwelling can be built taller than a coconut tree. And the one main road doesn't go right round the island. Nothing could ever slice a path through the prehistoric stone canyons of the eastern Na Pali coast. It gradually dawns on you that you've seen the place before. In Raiders of the Lost Ark, the mountains and jungles stood in for South America; in Jurassic Park and its sequels, the Lawa'i Valley became the valley of the dinosaurs; and Ben Stiller's 2007 spoof action thriller Tropic Thunder injected $60 million into the islands' economy. Some tourists are wary of the north side because regular rains punctuate the tropical heat. In fact the rain is blissfully welcome, rarely lasts more than 90 seconds and leaves the mountains looking rinsed and glorious. The north side is where the richest visitors buy beachside properties. This is also where the best beaches and food are found. Hanalei is the main attraction here. You drive through lush hillsides, with views of the undulating Pacific as it rolls into 1.6-kilometre-long, horseshoe-shaped Hanalei Bay, while above your head flicker bright-red honeycreeper birds, and suddenly you find yourself surrounded by clapboard shops selling surfer gear, skateboard impedimenta and every manifestation of hippie chic. You look at the passing multitude as they queue for burgers, boogie boards and shaved ice (a Kaua'i speciality) and marvel at the naturalised 'transplants' from San Francisco and Seattle, easily recognisable by their elaborate Polynesian tattoos and abstracted, surfer-dude air. There's a couple of dozen cafes, smelling of cinnamon and vanilla, and a few restaurants – none better than Bar Acuda, which is packed in the evenings with moneyed Californians in dressed-down T-shirts, greeting each other over Smoke & Ginger cocktails. The food is posh tapas, with lots of seared or carpaccio'd local fish, salads, dates and steak skewers. You might decide against a luau – the three-hour traditional Polynesian banquet-and-show with dancing girls and (eek!) audience involvement – and prefer to go people-watching at the St Regis Hotel in Princeville. Even connoisseurs of luxury vacations will find their jaws dropping: this former livestock ranch and sugar plantation, sold to developers in the 1960s, features a palm-tree-lined drive through million-dollar apartments, two world-class golf courses set amid lush scenery, a 930-square-metre spa and a panorama bar where exhibitionists congregate at sunset. It's a phenomenal hotel, though intimidating in the vast scale of the restaurants and puzzling in the paradox of being both super-exclusive and super-packed-out. 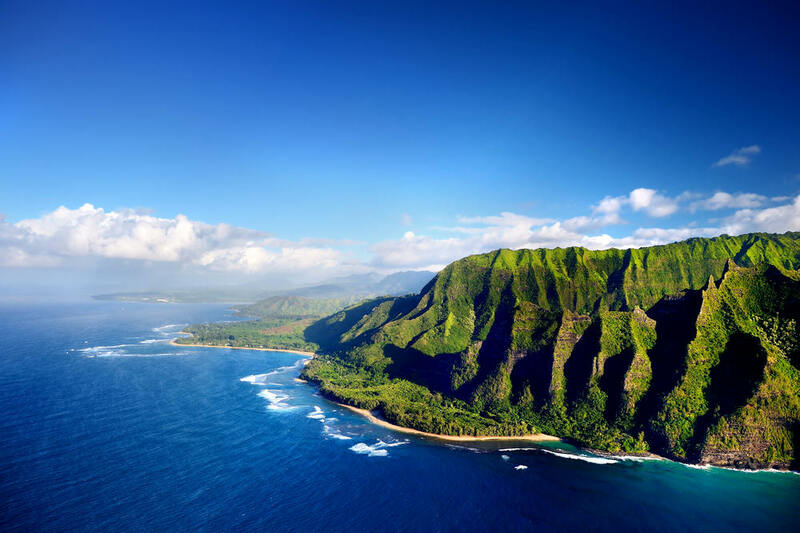 Heading west from Princeville, the road weaves around heart-stopping glimpses, through the spruce trees, of the green swell and the ice-cream-whitecaps of the languorous ocean. This is where they filmed South Pacific in 1958, using wholly otiose colour filters to enhance the sunset scenes. Mitzi Gaynor sang I'm Gonna Wash That Man Right Outta My Hair on Lumahai Beach, where the sands are wide but the riptides deadly. The dramatic 390-metre verdant Matterhorn before you is known to locals as Makana (or 'gift') but in the film was Bali Ha'i. The most beautiful beach on the island is Makua, known as 'Tunnels' because in winter the waves form big, surfer's-dream tubes. It's perfect for lolling in the shade or snorkelling off the eastern rocks; surfers have to go kilometres out beyond the reef to catch the waves. On the journey to the crowded Ke'e Beach, where the road runs out, you pass the Maniniholo Dry Cave, echoing, dripping and claustrophobic, and gawp at 30-metre cliffs down which bleached tree-roots reach to the roadway in search of water, and resemble ancient faces covered in kilometre-long wrinkles. Drive clockwise around Kaua'i's emerald clockface on the Kuhio Highway, and see how the scenery changes. At two o'clock (so to speak) you're in Anahola, which is Hawaiian homeland territory: look out for houses on stilts and shacks glimpsed in the jungly undergrowth. At three o'clock, you're in charming Kapa'a, the only walking town on the east side and the most densely populated on the island. It's a sprawling Western film set; a charming township of shabby-chic clothes, furniture and antiques. I loved it: breakfast in the wooden booths of the Olympia Cafe, where they serve papaya and melon with your scrambled eggs; the old Liquor & Wine Store, festooned with photos of Kyle, the proprietor, and his family in the 1950s; the shining ukuleles and 'slack key' guitars at Kamoa (1310 Kuhio Highway); the simple box-lunch at Pono Market, showing the island's Japanese influence: pineapple-glazed chicken, ahi poke (raw tuna) with sticky rice and a salsa of salmon and tomato. Further south, the shops turn into malls, but a right-hand turn, by the ruins of the Coco Palms Hotel (where Elvis Presley shook his booty in Blue Hawaii) brings you inland, following the Wailua River, to check out the impressive Opeaka'a Falls and find spiritual refreshment at the impressive Hindu monastery. The south side is dry and parched. Hectares of former sugar plantation lie fallow, and the landscape's all African-style red clay. At the southern tip the big hotels, condominiums and time-share properties of Po'ipu have been joined by the massive 400-hectare Kukui'ula tourist development. Follow the main highway to Hanapepe Valley. Salt Pond Beach Park is a safe and family-friendly spot and, every Friday evening, the island's art lovers congregate in Hanapepe for a passeggiata along the galleries in the main street. But there's only one real serious tourist attraction down here, and it's a stunner. Head for Waimea, a small town where Captain Cook landed in 1778, turn right and drive for half an hour, up through twisty serpentine roads: you'll find yourself staring, like stout Cortez, at the chasmal magnificence of the Waimea Canyon, a distant but awesome cousin of the grand Arizonan ravine. Every year, hundreds of people hike or trek their way through the canyon floor on the 72 kilometres of trails, though rain makes conditions hazardous. Far better, if you can afford it, to take the indulgent option: a helicopter ride over the whole island. You'll soar over the gigantic Mount Wei'ale'ale, officially one of the wettest places on Earth, over the fabulous double waterfall shown in the opening scenes of Jurassic Park, over Waimea Canyon and the Na Pali coastline before dropping you back for an hour of surfing, shaved ice and a siesta on Hanalei Beach – marvelling to find that such a charming and restful island is essentially a great, jagged, unconquerable, volcanic monster with a lot of lucky people occupying its mild and paradisical perimeter. This article was written by John Walsh from The Daily Telegraph and was legally licensed through the NewsCred publisher network.